If you want to see where socialism takes a country, go to today’s Venezuela. After 18 years of a left-wing populist regime committed to “21st Century Socialism,” a once-wealthy and relatively stable nation is coming apart. 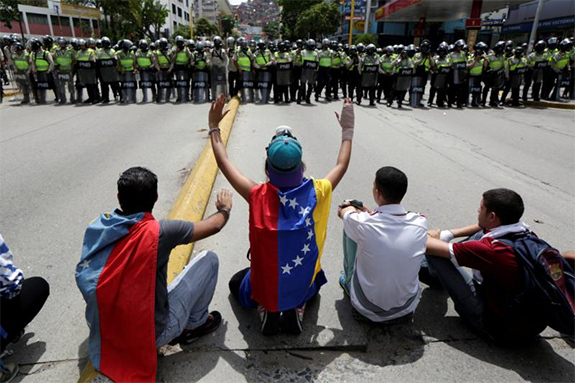 For months, thousands of Venezuelans—tired of food shortages, denied free elections, subject to unambiguously socialist economic policies, forced to watch opposition leaders being jailed, burdened by the all-pervasive presence of Cuban “advisors,” and brutalized by security forces—have been protesting in the streets of all major Venezuelan cities. And what they want is clear: President Nicolás Maduro and his regime must cease behaving like a dictatorship and allow free and fair elections. The government’s response has been equally clear: fiery denunciations of its opponents as “enemies of the people” and, above all, repression, repression, repression. One institution which has remained free of the regime’s control is the Catholic Church. For years, Venezuela’s Catholic bishops have bravely underscored the abuses of the government first led by the man whose personality and socialist policies lit the fuse for the current conflagration—the late Hugo Chávez—and now by his successor Nicolás Maduro. Chávez’s response to similar criticism was to publicly insult Catholic bishops while proclaiming, in near-blasphemous terms, that “Jesus was the first socialist.” Maduro has upped the ante. Chávista thugs regularly attack Catholic priests in churches and Catholic university students in the streets. In April this year, they interrupted the Chrism Mass of the Archbishop of Caracas, Cardinal Jorge Urosa, during Holy Week—which included roughing up the cardinal. Yes, Francis has called for prayers for the suffering people of Venezuela—though without mentioning the very clear causes of their suffering. The Pope also wrote a letter to Maduro in April 2016, the contents of which are unknown. Maduro then visited the Vatican and met Pope Francis in October. This was followed by the Holy See serving as a mediator for negotiations between the Maduro regime and the opposition in the last quarter of 2016. The talks, however, collapsed quickly when the government refused to contemplate calling elections or releasing political prisoners. Francis hasn’t stopped asking for more dialogue between the regime and the opposition. Precisely what that means when the regime’s idea of “dialogue” is to imprison opposition leaders and tear-gas protestors is unclear. 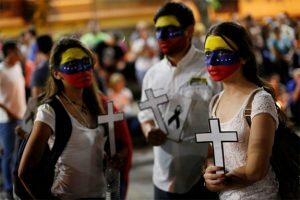 More recently, Francis urged Venezuelans in a May 5 letter to bishops to promote a “culture of encounter” as a way of working towards resolving the country’s rapidly-deteriorating situation. Again, however, one must ask: what sort of “encounter” is supposed to happen between people who simply want freedom and a dictatorship that deploys violence every single day against its own people? So what’s going on? At least three factors, I’d suggest, need to be considered. First, or so the argument goes, neither the pope nor the Holy See can be a credible mediator between the regime and the opposition if it is seen as supporting one of the two sides. That’s a reasonable position. But there’s one problem with this argument. Mediators surely aren’t expected to stand to the side patiently waiting for the conversation to resume while one party to the discussion beats the living daylights out of the other. Being a mediator doesn’t imply that you cease speaking the truth out-loud and emphasizing the requirements of justice. In the years leading up to and following the Polish Communist regime’s declaration of martial law in December 1981, for example, Pope John Paul II was certainly involved in the Church’s efforts to mediate between the government and the Polish people. Yet the pope also made it abundantly obvious that he supported the Polish people’s just aspirations for liberty. At this stage, it’s hard to argue that Francis has made his position vis-à-vis the Venezuelan situation anywhere near as clear. Indeed, Maduro recently accused Venezuela’s bishops of being out of step with the pope’s call for dialogue when they refused to participate in an effort to rewrite Venezuela’s constitution. Of course, it’s a ridiculous accusation for Maduro to make. Yet it gains a veneer of credibility by virtue of the fact that Francis has not, in his own words, said anything directly and publicly critical of the Maduro regime. To do so, some believe, would only make matters worse. But how could the situation in Venezuela get any worse than it is right now when your average Venezuelan has lost an estimated 19 pounds in weight because of lack of food? Venezuela’s problems are clearly the result of socialist policies being imposed by a left-populist regime upon its own people. The Venezuelan bishops haven’t hesitated to describe this as the “fundamental cause” of Venezuela’s woes. The Chavez-Maduro regime has certainly created, to use Francis’s words, “an economy that kills.” But it’s not a market economy. It’s a socialist economy freely chosen and created by Venezuelanleftist-populists. There are no mysterious forces “out there” which forced Venezuela down this path (though functionaries imported from Communist Cuba have been doing their best to keep Maduro in power since 2014). While Maduro regularly blames “Yankee imperialism,” Venezuela’s disastrous situation is squarely the fault of left-wing populist Venezuelans who, like all socialists, refuse to acknowledge that such policies alwayslead to long-term economic ruin and can only be maintained in place by governments prepared to use “extra-constitutional” methods. Third, there is the uncomfortable fact that Pope Francis has publicly associated himself with other left-populist Latin American leaders whose ideological outlook and economic policies are very similar to those of Chávez and Maduro. In 2015, for example, Francis spoke at an event in Bolivia held by the World Meeting of Popular Movements in which he used language that would fit very well into the speech of your average Latin American populist politician. Moreover, Francis spoke these words while seated next to Bolivia’s President Evo Morales: a Latin American left-populist head of state who professes admiration of Chávez and continues to defend Maduro’s regime. 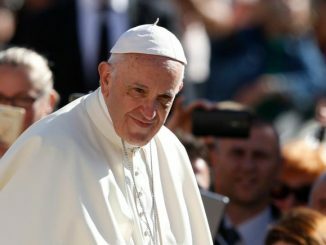 Speaking directly and clearly about the political and economic damage inflicted by a left-populist regime would imply Francis putting distance between himself and left-populist leaders, movements and governments throughout Latin America, or even criticizing the whole phenomenon of Latin American populism itself. Francis has, however, on at least two occasions (and recently) described Latin American populism as healthy because it makes “the people . . . the protagonists” of their destiny. All of these associations and sentiments inevitably raise questions in some peoples’ minds about the pope’s willingness to accept that there is a straight line between Latin American populism and regimes like Maduro’s. Personally, I’m not sure that’s a fair criticism of Francis. 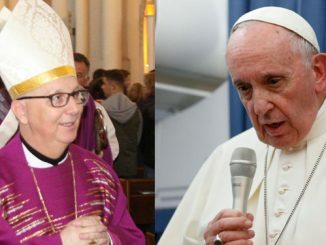 While archbishop of Buenos Aires, Cardinal Jorge Bergoglio had to cope with a left-populist government which inflicted enormous economic damage upon Argentina. He wasn’t afraid to criticize left-wing populist governments such as those lead by presidents Néstor and Cristina Kirchner. But it wasn’t their populism per se which he criticized. Rather, Bergoglio focused on things like corruption. There is, however, a price to be paid for this—at least at the level of perceptions, which, whether we like it or not, matter in our media-driven world. 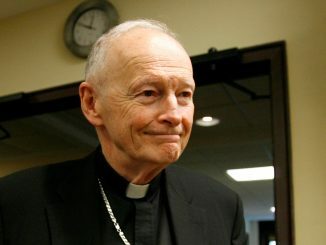 As one Catholic professor remarked to me during a recent trip to Latin America, “Many are saying that the Holy Father would be far tougher and direct if the Venezuelan dictatorship was of the right-wing variety instead of a left-wing regime that’s justified itself from the very beginning by talking endlessly about el pueblo.” This is, of course, simply speculation on the part of some Latin American Catholics. But the fact that they are openly expressing such thoughts is telling. It’s also clear that the pope’s apparent reticence to say anything too critical of the Maduro dictatorship is causing some in the Venezuelan opposition to lose patience with Francis. In an interview in Brazil on May 11, Tintori described what she called the pope’s “insistence” that the opposition enter into a dialogue with the Maduro regime as “unacceptable.” For her, the regime’s flat refusal to fulfill any of the minimal conditions, such as the freeing of political prisoners like her husband, means that there’s nothing to dialogue about with the regime—except the terms of its departure from power. In Tintori’s view, general elections are needed immediately. Instead of talking endlessly about “dialogue,” she argues, the Vatican should spend more time defending the lives and fundamental human rights of Venezuelans that are being violated daily by the regime. Tintori then added that the pope’s claim in one of his mid-air interviews that the Venezuelan opposition was “divided” is simply incorrect. “The opposition,” Tintori said, “is united” and determined to achieve its objective of immediate general elections. 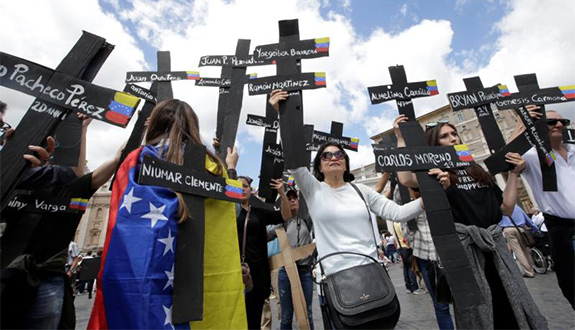 In recent weeks, the Holy See’s Secretary of State, Cardinal Pietro Parolin (who served as nuncio to Venezuela between 2009 and 2013) has stated that Venezuela needs fresh and fair elections. This echoes the position of Venezuela’s bishops. They, however, have been equally insistent that part of the way forward involves “ensuring the rule of law.” This implies a return to a form of government that constitutionally limits the state’s power in society and the economy. It’s tempting to believe that the Maduro government will simply collapse as conditions get steadily worse. North Korea and Cuba, however, illustrate that tyrannical regimes can stay in power for a very long time if they have the will to do so. Another possible scenario is a military uprising lead by junior army officers sickened by what the regime requires them to do to their own people every day, tired of taking orders from Cuban advisors, and, like millions of other Venezuelans, struggling to feed their families. There’s nothing, however, in the mindset of left-populist leaders like Maduro to suggest they will let themselves be brushed aside. There’s every reason to believe that the regime would fight back, thus accentuating what is, in many ways, already underway in Venezuela: a bloody civil war. And then, I wonder, how many Venezuelans will bother asking, “Where is Pope Francis?” They’ll be too busy fighting for nothing less than their lives and liberty. The Church does not prevent this type of socialism from taking root because the Church is in favor of many leftist issues. This is also true here in the US. The Pope would be much more vocal if there were “unfettered capitalism” or a wall being built. The Pope who smiling accepted a “gift” from the President of Bolivia, a Crucified Jesus, OUR LORD, on a Hammer and Sickle. As long as Maduro is not harming the environment, he can torture and imprison as many of the opposition as he wants in his “Culture of encounter”. WHERE is our St. Catherine of Sienna when we need her? Yes, Pope Benedict. Our Church is a ship in danger of capsizing if God does not rescue her soon. Firstly, this crisis is entirely self-inflicted by the people of Venezuela upon themselves. A few short years ago the masses of ‘the people’ were in the streets singing the praises of “Hugo y Fidel y Che’. Oil, and oil only, was their salvation and Chavez their messiah. All false, all bad, all wasted. The socialists, once again, have run out of other peoples money to spend. As for the bishop of Rome…he kneels at the altar of socialism. Chavez and Maduro are not the problem for this faux humble pope. 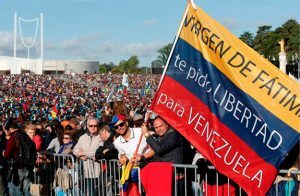 Francis will remain silent in the face of Maduro and his army and his socialist poison. Bet on it.